Cold-blood murder and extrajudicial assassinations reflect longstanding Israeli policy, terrorizing an entire population, defenseless against the daily onslaught. Palestinians have no place to hide, trapped throughout the Territories, victimized with no world community support, murdered by Israeli forces, including 17 young children since October 1 alone. Soldiers and police have shoot-to-kill orders. The Palestinian Red Crescent Society (PRCS) can’t keep up, its operations ongoing round-the-clock, dispatching medical and relief teams wherever needed, often blocked by soldiers from reaching the injured and dying. PRCS runs two main Operations Rooms – at its Al-Bireh headquarters and Gaza City, as well as two others in Nablus and Hebron, each staffed with over 50 volunteers, caring for sick, wounded, suffering and dying Palestinians, issuing regular reports on its activities and Israeli abuses against its staff, ambulances, facilities and overall operations. It increased them sharply last month, in response to Israeli initiated violence, heavily overworked, struggling to keep up with overwhelming needs. The Society’s Operations Room has been the quickest source of information for journalists since the beginning of the current situation. For me personally, it was my first source of information on confrontations and casualties, and I am in constant contact with colleagues at the OR. Reports highlight multiple daily Israeli-instigated violence throughout the Territories, including in Occupied Gaza – nonviolent resisters lethally shot or wounded, vital agricultural land uprooted, fishermen attacked at sea threatening no one. Soldiers and police have one operating standard – shoot first, ask no questions, blame Palestinians for their high crimes. Journalists are assaulted daily for doing their job, at least 105 targeted in October alone, according to the Center for Development and Media Freedoms (MADA). Scores were wounded from live fire, potentially lethal rubber/plastic coated steel bullets, toxic tear gas, stun grenades and physical beatings – their equipment confiscated or destroyed. Over a dozen others were arrested, detained and brutally interrogated. Israel wants none of its crimes against humanity revealed, especially with hard to dispute video evidence. MADA reported at least 450 violations against journalists since January, escalated exponentially since October 1. Nonviolent demonstrations for justice are viciously attacked, followed by mass arrests. 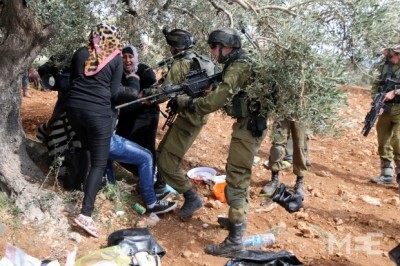 The world community is virtually silent in the face of extreme Israeli viciousness – heavily armed combat troops attacking defenseless civilians, including women and children. Judge Israel by its actions, not its duplicitous rhetoric.